I remember my grandmother telling me bedtime stories when I was a child. Her tales of animals, birds, trees and forests took me to unknown lands of fantasy. One of the stories that has stayed with me was called Goolar ke phool. The story was about goolar (fig) flowers which were seen by only lucky people, and whoever was able to see them would find a treasure or a lost kingdom. Excited at the prospect of coming across a hidden treasure, I would often look curiously at the wild fig trees along the roadsides in the hope of finding the flowers. Small wonder I never got lucky. I came to know later in school that the small figs I saw on the trees were actually flowers which I mistook for fruits. I learnt in my biology class much later that the fig is an inflorescence (cluster of flowers) called syconium. This is an urn-shaped structure with the flowers hidden inside. The receptacle is fleshy, which makes fig a pseudo fruit. The flowers are pollinated by small insects that crawl in through tiny openings in the cup. By the time a fig is ripe, the insects complete their life cycle—a perfect example of symbiosis between flowers and insects. People in India consider the fig tree sacred and it is often planted around houses and temples. They are also planted as shade trees in coffee plantations in south India. Interestingly, fig was never cultivated in the country. It was foraged during the harsh summer months and at the beginning of monsoon when green vegetables were scarce. Vendors who sold the fruit in the market had to collect it from the jungles or roadsides. Figs are a favourite of macaques, squirrels and most birds, particularly barbets, tree pies and parakeets. 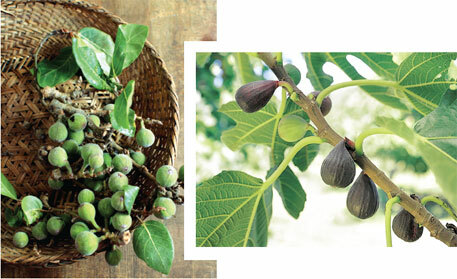 Thanks to the dispersal of seeds by animals, fig grows in the wild all over the country. Scientifically called Ficus racemosa, the Indian fig tree is a relative of banyan and is popularly known as cluster fig or country fig. The fruit is called anjeer in Urdu. The name is popular in Hindi as well. Bengalis better know it as dumur. Although goolar and anjeer refer to the same fruit, the names are nowadays used for two different varieties, probably depending on the place of origin. Goolar (Ficus racemosa ) is the local variety which grows in the wild. It is small in size and mildly sweet when ripe. Figs that are imported from Persia, Iran and Afghanistan are known by the Persian name anjeer (Ficus carica). This variety is larger and sweet when ripe. The Persian fig is preferred for its taste and attractiveness—it is fleshy and has a deep purple colour. Today these are sold in India in upmarket stores at a premium price. For the past few years, a hybrid variety of fig is being cultivated in Maharashtra by crossing the Indian goolar and the Persian anjeer. This variety is called Puna fig or puneri anjeer. Goolar comes with a host of health benefits. It has cooling, purifying, healing and anti-inflammatory properties, according to Ayurveda. Science, too, validates these medicinal claims. A review published in the International Journal of Pharmaceutical Sciences Review and Research in 2010 shows that the fruit can help reduce cholesterol. The soluble and insoluble fibre in the fruit is prebiotic in nature, which helps maintain a healthy gut. I have always associated goolar with my grandmother. She not only told me stories about this wonder fruit, but also knew how to use it to cure day-to-day ailments. Living up to a ripe old age of 105, she always turned to goolar when she had an upset stomach. She would mostly make goolar ka chokha (boiled and mashed fig with seasoning), although she loved the spicy meaty curry cooked with it. During my days in Jharkhand, I learnt from the tribes there that the dehydrated and powdered raw goolar can be taken with sugar candy to treat E. coli infections. Goolar ki sabzi has always been a family favourite. The last time I tasted this curry was a couple of years ago when I was visiting my home in Varanasi. I miss the delicacy here in Delhi. Although I had noticed a few goolar trees around my colony, I never took the pain to pluck the fruit myself. But last month I decided to try out a few recipes I learnt from my grandmother. I asked the gardener to bring me some figs from the nearby trees and he obliged. I cooked chokha and kabab and made pickle with the remaining figs. To cook raw goolar, one has to cut the fruit in quarters, clean the interiors of all the floral parts and insects. The fleshy receptacle is parboiled and then either curried or mashed to make bharta, or chokha. Ripe figs of all varieties are highly perishable—they start softening very fast and rot within a couple of days. Dehydrating can preserve them. The imported figs are dehydrated and called sookhi anjeer. This is an excellent remedy for constipation. Just soak it overnight and take it with milk the next day. The natural sweetness of sookhi anjeer (see recipe) is similar to that of raisins and currants; this makes it useful in flavouring sugar-free desserts such as kulfi and ice cream. Boil the goolar in sufficient water till soft. Drain the water. Mash the goolar or blend in a blender. Mix with the other ingredients. Serve with khichdi, daal and rice or as a side dish to any Indian meal. Method Boil the goolar in sufficient water till soft, drain and let it cool. Mash with the other ingredients, except ghee, to make a dough-like mixture. Shape the dough into lime-sized balls and flatten them between the palms. Shallow fry in batches. 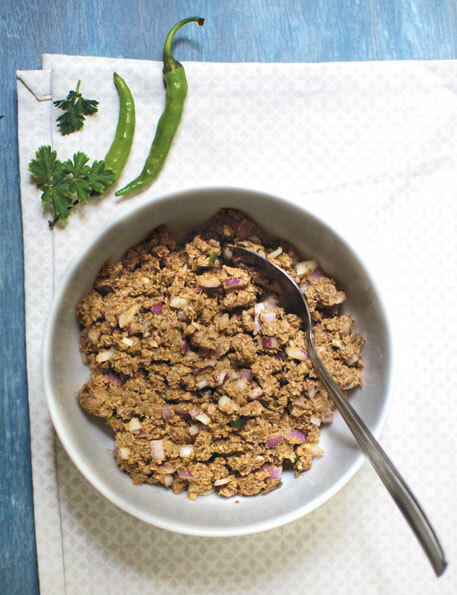 Serve hot with tamarind or green chutney.